Behavior: Where do young peregrines go when they leave home? Question: Where do young peregrines go when they leave home? Do they migrate? Answer: It depends on where they were born. Peregrine falcons born in the Arctic do migrate on traditional north-south routes but those born in the middle latitudes, such as Pittsburgh, don’t migrate in the classic sense. Mid-latitude peregrines live where their food (birds) is plentiful all year so they don’t have to go south to find it. Instead they just wander. It’s this behavior that gave them their name. Peregrine means wanderer. Juvenile peregrines wander the most. By the time they’ve been flying for about a month, they’re able to hunt on their own. They still beg from their parents until six to ten weeks after fledging, but more often than not their parents ignore them. Soon the juveniles become independent and restless. Each young bird makes exploratory trips away from home and on one of those trips he just keeps going. Scientists knew peregrines wandered but no one knew exactly where they went. The bands on nestlings helped determine their start and end points but where they went in the middle was a mystery. To answer this question the Pennsylvania Game Commission conducted a telemetry study, placing satellite transmitter backpacks on five juvenile peregrines from Harrisburg and Pittsburgh in 2002 and 2003. The backpacks transmitted date, time and location to a satellite, thus giving a momentary snapshot of the peregrines’ locations. The Game Commission downloaded the data and plotted the birds’ paths. The results are quite intriguing. Here’s an animated map showing the path of a juvenile male peregrine from Pittsburgh who was fitted with a telemetry device in the spring of 2002. As you can see, he wandered sometimes traveling 200 miles a day. 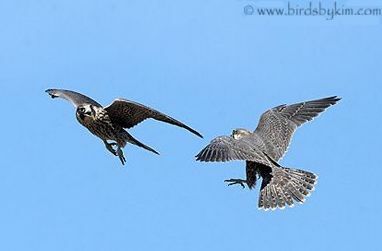 Immature peregrines wander until they’re about two years old. Then they claim a nesting territory as their own and, if all goes well and there’s food in the winter, they stay there the rest of their lives. Where do they finally end up? See Pitt Alumni and Rochester’s Beauty for some answers. Thank you for the fascinating information Kate.